The eighth largest asteroid, #15 Eunomia, was discovered by A. De Gasparis. C. Jackson discovered asteroid #1431 Luanda. Bumper No. 7 was the second launch from Cape Canaveral, a maximum range test of a two-stage vehicle, to study problems in staging. Bumper Number 7, a converted German V-2 with a WAC upper stage, was the second missle launched from Cape Canaveral, Florida. It was launched 29 July 1950 as a maximum range test of a two-stage vehicle, to study problems in staging. Initially delayed by moisture in the vehicle, the WAC finally achieved the highest sustained atmospheric speed to date (Mach 9, 2500 m/s) and a 35.2 km altitude before impacting 305 km downrange. The USCG icebreaker Eastwind left Thule, Greenland for the first science Rockoon (balloon-launched rocket) launches by an ONR group under James A. Van Allen. The low-cost technique was used by researchers in 1953-57 from ships between Boston and Thule. US President Dwight D. Eisenhower signed the National Aeronautics and Space Act of 1958, Public Law 85-568, authorizing the creation the National Aeronautics and Space Administration (NASA). J. Schubart discovered asteroid #2000 Herschel. The US Air Force launched the Atlas D MA-1 spacecraft test mission from Cape Canaveral, Florida, which failed when the booster exploded about a minute after launch. Mercury Atlas 1 (MA-1) was a test vehicle launched on a ballistic trajectory on 29 July 1960 as a test of spacecraft/launch vehicle compatibility and thermal loads in a critical abort, under maximum heating conditions. The primary mission goals were to check the integrity of the spacecraft structure and afterbody shingles for a reentry associated with a critical abort, and to evaluate the open-loop performance of the Atlas abort sensing instrumentation system. The spacecraft was not equipped with an escape system and no test subject was on-board. Standard posigrade rockets were used to separate the spacecraft from the Atlas, but the retrorockets were dummies. Liftoff and flight of the vehicle were nominal until 57.6 seconds into the flight when a shock was registered by both the launch vehicle and spacecraft axial accelerometers, because of a launch vehicle and adapter structural failure. When the shock occurred, the vehicle was at approximately 9.1 km altitude and 3.4 km down range. All Atlas telemetry was lost at 58.5-59 seconds after launch, when the final missile destruction was believed to have occurred. Spacecraft telemetry continued to be transmitted until 202 seconds. The spacecraft was destroyed upon impact with the Atlantic Ocean, about 8 km down range, because the recovery system was not designed to actuate under the imposed flight conditions. Most of the spacecraft, engines, and the liquid oxygen vent valve were recovered later from the ocean floor. Since none of the primary flight objectives was achieved, Mercury-Atlas 2 (MA-2) was planned to fulfill the mission. NASA and the USAF launched X-15A Heat Transfer/Local Flow test mission # 112, the first test of various heat-resistant panels attached to the fuselage, in which Joe Engle reached a maximum speed of 5250 kph (Mach 5.38) and a maximum altitude of 23.774 km. NASA issued a tentative planning schedule for the remainder of the Apollo program, missions 12 through 20. NASA's Mariner 6 started transmitting pictures of Mars as it approached the planet. NASA Apollo 15 went into orbit around the Moon during the fourth Lunar landing mission. 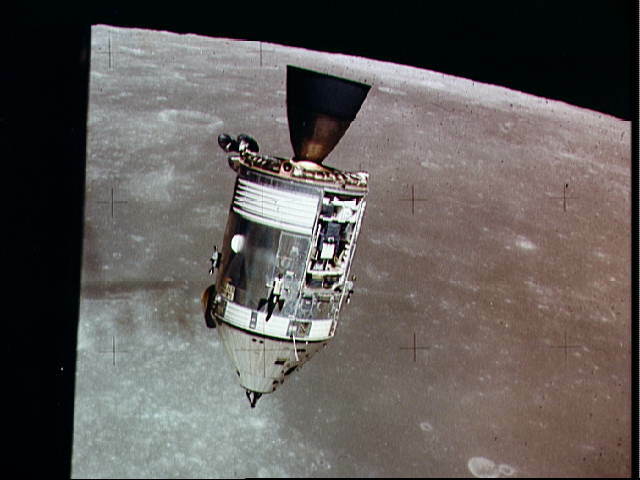 The Saturn IV-B stage used to boost NASA's Apollo 15 to the Moon impacted the Lunar surface at 1.51 S, 11.81 W, as planned, at a velocity of 2.58 km/s, and at an angle of 62 degrees from horizontal. USSR launched Zarya s/n 122 on a Proton-K booster from Baikonur, planned to be the second Salyut space station (DOS 2), which failed to reach orbit because of a second stage malfunction at T+162 seconds. USSR launched Molniya 1-S into geostationary orbit from Baikonur, evidently a unique experimental satellite, with arrangements for experimental television broadcasts and establishment of long range radio communications. NASA launched the NOAA 5 weather satellite from Cape Canaveral, Florida. 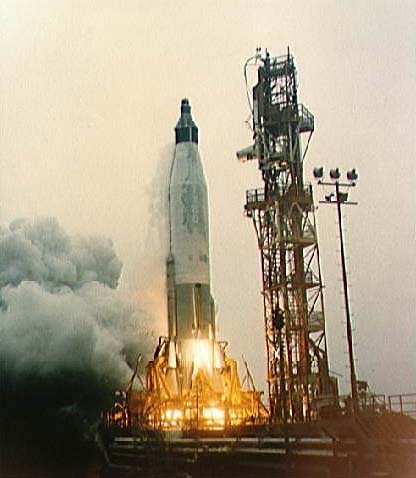 NOAA 5, launched 29 July 1976, was one in a series of improved TIROS-M type satellites with new meteorological sensors on board to expand the operational capacity of the ITOS (NOAA) system. The primary objectives of NOAA 5 (ITOS-H) were to provide global daytime and nighttime direct readout cloudcover data on a daily basis. The sun-synchronous spacecraft was capable of supplying global atmospheric temperature soundings and very high resolution infrared cloudcover data of selected areas in either a direct readout or a tape recorder mode. A secondary objective was to obtain global solar proton density data on a routine daily basis. The primary sensors consisted of a very high resolution radiometer (VHRR), a vertical temperature profile radiometer (VTPR), and a scanning radiometer (SR). The VHRR, VTPR, and SR were mounted on the satellite baseplate with their optical axes directed vertically earthward. The nearly cubical spacecraft measured 1 x 1 x 1.2 m. The satellite was equipped with three curved solar panels, folded during launch and deployed after orbit was achieved. Each panel measured over 4.2 m in length when unfolded and was covered with 3420 solar cells, each measuring 2 x 2 cm. The ITOS dynamics and attitude control system maintained the desired spacecraft orientation through gyroscopic principles incorporated into the satellite design. Earth orientation of the satellite body was maintained by taking advantage of the precession induced from a momentum flywheel so that the satellite body precession rate of one revolution per orbit provided the desired 'Earth looking' attitude. Minor adjustments in attitude and orientation were made by means of magnetic coils and by varying the speed of the momentum flywheel. The satellite was placed in a sun-synchronous orbit with equatorial crossing of the ascending node near 0830 AM local time. During the 2h 5m Salyut 6 EO-2-1 EVA, cosmonauts Aleksandr Ivanchenkov and Vladimir Kovalyonok on the Soviet Salyut 6 space station retrieved material samples and equipment. A meteor passing below them briefly blinded the cosmonauts. USSR launched Cosmos 1284 from Plesetsk, a medium resolution photo surveillance satellite which also performed Earth resources tasks in the interests of various branches of the national economy of the USSR and international cooperation. NASA moved the GOES 6 satellite from its original orbital slot at 135 deg W to 98 deg W (a more central position) when GOES 5 failed. USSR Soyuz T-12 landed, returning cosmonauts Dzhanibekov, Savitsakaya and Volk from their visit to the Salyut 7 space station. NASA launched STS 51-F (Challenger 8, 19th Shuttle mission) carrying Spacelab 2, which resulted in an "abort to orbit" ascent. NASA's Deep Space 1 spacecraft flew by the near-Earth asteroid 9969 Braille at a distance of about 26 km. White Knight/SpaceShipOne Flight 29C/02C was made, a man-in-loop launch rehearsal and inflight checkout of all ship systems, the first manned captive carry flight of Scaled Composite's SpaceShipOne Ansari X-Prize competitor.